Deer, rabbits, squirrels, woodchucks and birds, especially crows, can cause troublesome damage in the vegetable garden. In some areas, chipmunks, porcupines and voles develop a taste for vegetables. Raccoons notoriously appear just as the corn is ripening. Proper fencing provides the most reliable way to exclude the larger mammals from the garden. Choose the type of fencing most suitable for the animals that are known to be a nuisance in your area or neighborhood. Different types of fencing include wire mesh, welded wire, plastic meshes, and electric strands. Wooden fencing often requires added wire mesh or electric fencing to make it effective. When you install a fence, design it so that you can integrate future modifications if other pests become a problem. Birds can be excluded with row coverings and fine mesh materials, known as bird netting, supported over crops. Animal products such as predator urine, dried blood and meat proteins that induce fear. Repellents based on plant extracts can usually be sprayed directly on plants. First, spray one susceptible plant or part of a plant, then wait a day to see how the plant responds before spraying all of your plants. Some contact sprays might harm plants. Generally, repellents based on animal products are applied around the perimeter of the area you want to protect. They work best when plenty of palatable food is available outside of the treated area. Repellents suitable for landscape plants are not necessarily safe for edible plants. Read the label of any product carefully before purchasing to confirm that it is labeled for use on, or around, food crops. First, identify the pest - or pests - responsible for damage. Choose a repellent designed and labeled for the species. If possible, for best results, apply repellents before damage occurs. Otherwise, take action at the first signs of damage, before the animal becomes accustomed to feeding in your garden. Consider whether to spray the individual plants and/or treat the perimeter of an area. Individual animals have different taste and smell sensibilities, just as people do. One rabbit might run from blood meal sprinkled on the ground and another might hop right through. The number of animals in the population near your garden can affect how much damage occurs. One stray squirrel with plenty of attractive food to eat elsewhere is different from 10 squirrels depleting the local food supply. Repellents may not deter a truly hungry animal. Weather affects some repellents more than others. Monitor closely to determine whether to reapply after each rain or heavy dew. Animals adapt to certain smells and tastes. Changing brands of repellents during the season might increase positive results. Remove nearby resources that attract wildlife: birdfeeders, birdbaths, pet food, watering bowls, and unsecured garbage containers. Enclose compost that includes fruit and vegetable scraps in pest-proof bins. Remove potential habitat: brush, debris and rock piles, stands of weeds and overgrown grass (which provide cover for rodents and rabbits). Look for hoof prints, split and pointed at the front and rounded at the back, about 1 1/4” – 3 1/2” long. Deer droppings in the summer tend to be bunched up clumps, 1”- 2” in diameter, of dark pellet-shaped material. Deer tend to trample plants and feed in the late evening and very early morning. If deer are detected, act quickly because a few deer can inflict a lot of damage. If you know deer feed in your area, consider installing a fence prior to planting a garden. Physical exclusion is the most reliable method for protecting vegetable crops from deer. Though deer will not normally jump a 6’ fence, a 7’ – 8’ fence provides the best security. Deer can crawl under a standard plastic mesh fence. Secure the bottom of the fence with a strand of plastic or steel wire strung tightly from post to post. Generally, electric fences have proven less successful in excluding deer. Rabbits can thrive in suburban and urban areas as well as in rural habitat. They are active at dawn and dusk or at night, with most feeding in the few hours after sunrise or sunset. Droppings are round pellets, about ¼” in diameter. Rabbits will eat most vegetables, although they usually ignore corn, squash, cucumbers, tomatoes, and potatoes. A low fence of 2-foot chicken wire with 1-inch or smaller mesh will exclude rabbits. Be sure that the bottom is tight against the ground, or buried a few inches deep, to prevent the animals from pushing under the fence. The chicken wire can be rolled up and stored during winter to prevent deterioration. More permanent and more costly welded wire fences will last longer. 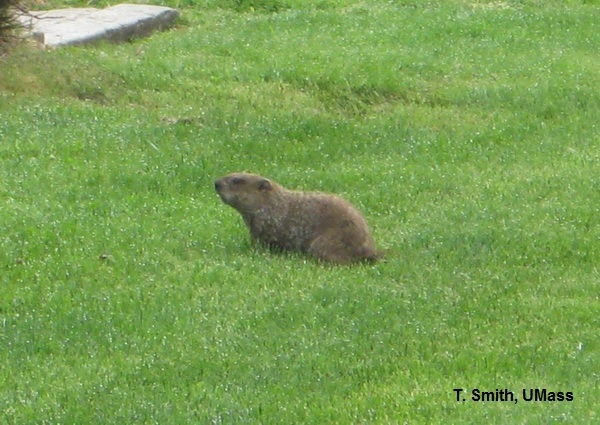 Woodchucks, or groundhogs, burrow in hedgerows, along the edges of fields or under stonewalls, outbuilding and porches. They feed during the day, especially in mid-morning or late afternoon. Woodchucks cover their droppings, so this sign isn’t usually present. They consume a wide variety of succulent herbaceous plants, including vegetables and fruits. They will gnaw on maturing melons and squash. Woodchucks are good climbers. Fences need to be at least 3’ high and sturdy, preferably welded wire. To discourage burrowing under the fence, bury the lower edge 10” – 12” deep. An electric fence wire 4” - 5” inches off the ground and 4”- 5” inches from the fence will discourage woodchucks from climbing. Electrified netting is also effective. Alternatively, the top 15” of the wire fence can be bent outward at a 45º angle. Though porcupines are more likely to injure fruit trees and berries, they sometimes develop a taste for certain succulent vegetables. Their droppings measure about ½” – 1 1/8” long and are sometimes slightly “C” shaped and strung together. These rodents have a strong attraction to salt from sweat left on tool handles and gloves. Fencing as for woodchucks is usually effective. Porcupines climb, but they don’t burrow. Squirrels forage actively at dawn and dusk. Chipmunks feed during the day. Both rodents may develop a taste for fruits such as tomatoes or strawberries or for sprouting seeds, but they injure leafy vegetables less frequently. Electrified netting or other small electric fences may be useful in keeping squirrels and chipmunks out of gardens and small orchards. Small domes or cages made of fine mesh (1/2” to exclude chipmunks) wire can protect individual plants or small rows until the plants, or crops, mature. Voles feed mostly at night. They can damage seedling by chewing stems and leaves. Voles feed on a wide range of garden plants including artichoke, beet, Brussels sprouts, cabbage, carrot, cauliflower, celery, lettuce, spinach, sweet potato, tomato, parsnip and turnip. Voles burrow through long tunnels at the interface of thick grass and soil, or just under the surface of the soil. They are poor climbers. Look for vole tunnels at the edges of grassy areas. Tilling and cultivating will destroy tunnels and discourage voles from entering the garden. Fear of predators, such as owls, keep them from crossing open ground; mow grass closely around the edges of the garden. Area repellents applied around susceptible crops may be effective if the vole population is low. 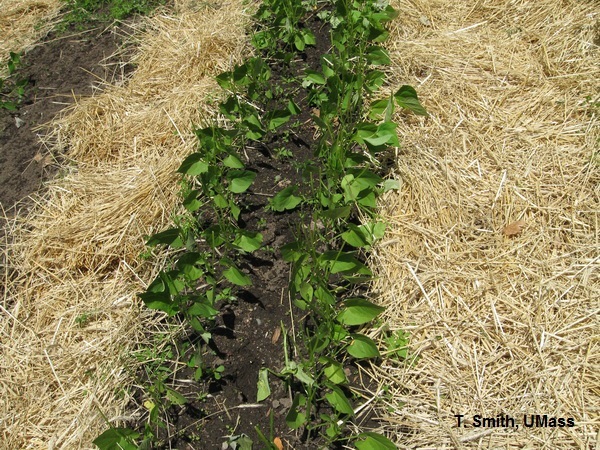 Fencing for voles requires installing 1/4” wire mesh at least 12” high and buried 6” – 10” in the ground. This can be attached to an existing fence and must be maintained weed-free. Raccoons will go through or climb most ordinary fences, especially for ripening corn and melons. Sturdy, well-maintained electric fences, properly installed, may exclude them. Repellents and scare tactics have little value in deterring raccoons. Crows and other birds may pull germinating seeds out of the ground. Crows love corn, but will also eat peas and beans; goldfinches will harvest beet and chard sprouts. Light weight, translucent row covers deter birds. Bird netting, supported over plants, excludes them from fruiting crops. Birds tend to acclimate quickly to scare tactics and repellents. For information on installing electric fences properly, contact a MassWildlife District office or your local farm supply business. In Massachusetts it is illegal to trap and then transport animals to another location. For information on legal means for managing nuisance animals consult the Massachusetts Division of Fisheries and Wildlife.